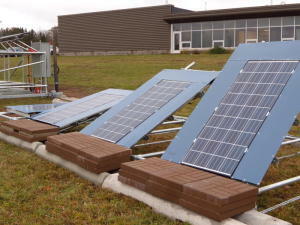 An experimental array of solar panels at Michigan Technological University’s Keweenaw Research Center, where it typically snows over 200 inches annually. Researchers aim to determine which angle yields the most electricity over the course of a year. Solar farms are a no-brainer in warm and sunny places, but what about in northern climates where snow can cover and even shut down the panels? Based on similar studies, year-round losses can be anywhere from a few percent (as found by Michigan Tech in a study looking at Ontario data) to 12 percent (39 degree tilt) to 18 percent (0 degree tilt), which Townsend measured near Lake Tahoe in California. Townsend's group developed a model to predict how snowfall and other related variables would affect energy generation. Now, they will test their model in collaboration with Michigan Tech using data from the KRC solar array and other test sites in Colorado, Pennsylvania and California. In addition, KRC is testing another method to boost its solar power generation. They will be adjusting the panels' angles throughout the year to track the seasonal position of the sun, which is close to the horizon in winter and nearly directly overhead at the summer solstice. "Pointing the array at the proper altitude can help to maximize energy generation while reducing snow losses," Meldrum said. You can view both tests on the KRC webcams. The above story is based on materials provided by Michigan Technological University, via Newswise.